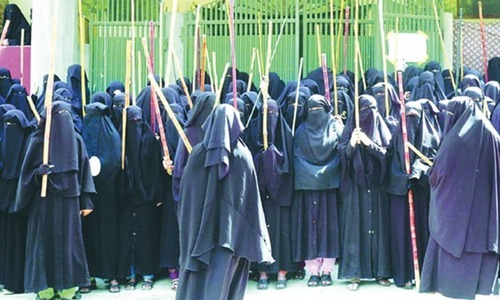 ISLAMABAD: Police and paramilitary troops were deployed at Jamia Hafsa on Saturday, police officials told Dawn. However, there was no official word on the deployment, and officials contacted were reluctant to discuss the issue. Some officials said the deployment was made to increase vigilance and intelligence gathering at the seminary, and to monitor those who visited the seminary. They said the measure was taken in view of the prevailing situation. The deployment annoyed students at the seminary as well as the administration. Officials said many climbed onto the roof of the seminary and chanted slogans, and added that messages were also sent to the police that the outcome of the deployment would be negative, and they would not be responsible. Capital administration officials including the assistant commissioner, as well as police, later came to the seminary to negotiate with the administration, and the majority of the contingent was eventually withdrawn. However, four vehicles of police and Rangers, each, remained at Jamia Hafsa. 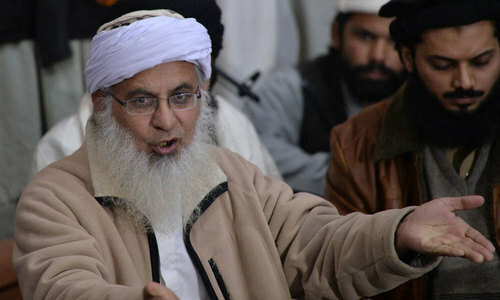 Lal Masjid spokesperson Ehtesham Ahmed said the contingent of police and Rangers came to Jamia Hafsa after the Zuhr prayers and were deployed in front of the seminar and on the roads leading toward it. 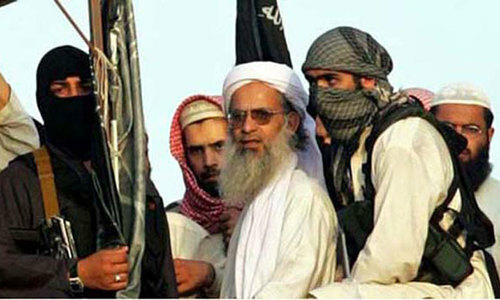 Mr Ahmed said the deployment bothered clerics associated with Lal Masjid and Jamia Hafsa as well as the students. 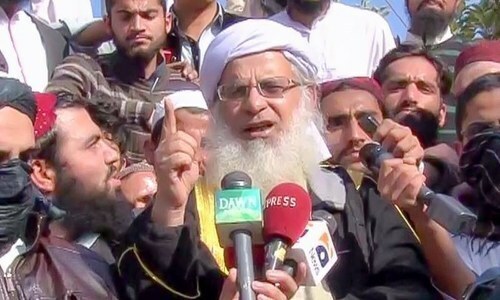 He said the capital administration and police were informed that they were responsible for the deteriorating situation and that if anything happened, “they will be responsible for it”. Writ of the State is written on the wall!! To FAUD. Writ of the state was destroyed when 10000 murderers of a party in karachi were released by national reconciliation ordinance and 700 corrupts of mega projects. Those were convicted criminals but NRO released them. You people now talk about human rights and writ of state? His presence in capital and open threats and challenges to the Govt. are clear and speaking evidence of inability of Pakistan's administration to free Pakistan from Terrorism. It further reflects the intentions of our Govt. to keep Pakistan related with terrorism. Why the administration is so reluctant to act against the seminary if there are any solid grounds to do so? 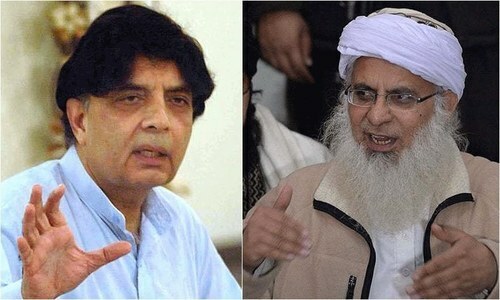 Why the authorities are so tight lipped about Maulana Aziz, is he involved in any wrong doing then deal with him according to the law of the country and if he is not then tell the people of Pakistan accordingly. It all seems that the authorities are either too frightened or have no idea what's going on in the seminary. Why police is asking him to take bail before arrest??? They are the trouble makers in this seminary and callanging the writ of the government by showing strength for the consequences as they are above the law. These people are not promoting religeon but forcing their will on the administration.It is up to government to deal with them. Lets have a different view: top slot of MQM is under non-bailable arrest warrants including the nominated mayor (somehow he escaped) for Listening Hate speech of the person abroad. On contrary, the one who is preaching hate right under the nose of FED is requested to take bail before arrest. Please tell us Without any prejudice, courage and sincerity, isn't it a political victimization??? All these so called religious folks take money from friendly countries to destabilise Pakistan. 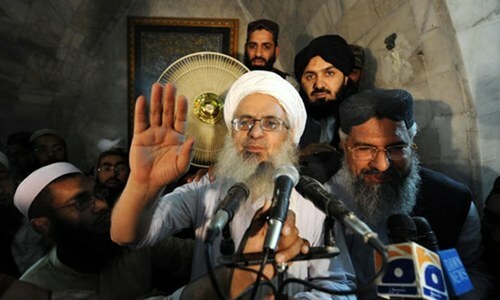 Lal Masjid ideology is extreme and it poses a challenge for the authority. We are having extremist ideology right in the middle of capital of Pakistan and the authority there seems to be helpless. So much show off on Uzair's arrest ,and no guts to be around seminary.what do you call this ,even handed approach? Arrest these trouble makers before they create more troubles.